Each month, Secret Recipe Club participants are assigned a participating food blog from which we’re to make a recipe. It's a secret, so you can’t tell them you are making something from their blog! I was assigned Recipe Taster and chose Alessio’s recipe for Cuban Picadillo. I was intrigued that a Sicilian man living in Bonn, Germany would cook up a Cuban dish. Then that’s Alessio for you! He’s a scientist, an artist, a food blogger, and calls himself a Renaissance man – a perfect description for someone with his range of talents and interests. But back to the food. 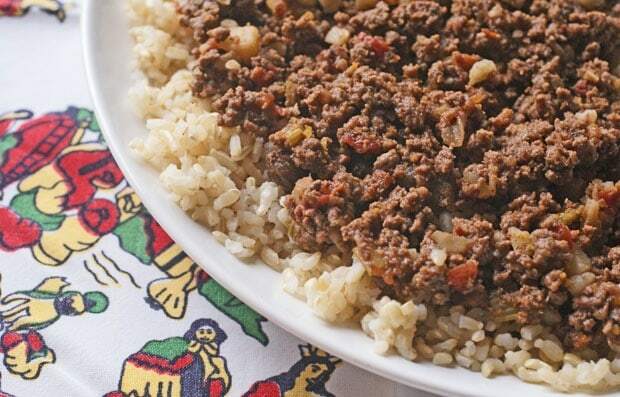 I love picadillo, a traditional dish in Cuba, Mexico, the Philippines, Puerto Rico and the Dominican Republic. 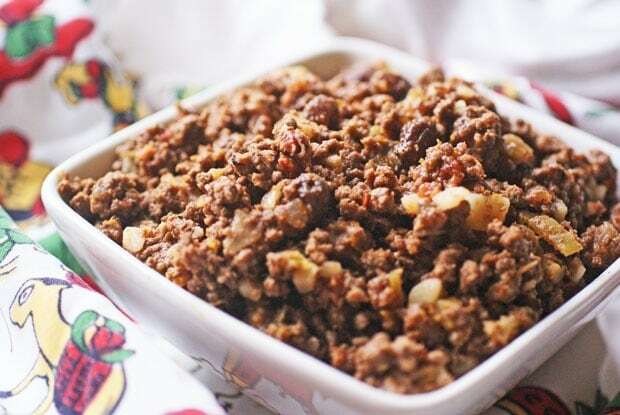 I usually make my picadillo in the slow cooker with onions, apples, raisins and spices. However, I wanted to make a different version and Alessio’s picadillo recipe looked perfect. I loved that he used raisins, olives and potatoes in his dish. However, I had a problem - I didn’t have any green peppers or olives in the house. So I improvised and replaced the peppers with celery, but thought the whole thing would fall apart without the olives. Instead, I decided to give the picadillo a Mexican flare by using chorizo, which I just happened to have defrosting in the refrigerator for our weekend breakfasts. I used ground venison and chorizo made from venison, both of which are very lean. (Our game processor doesn’t add fat to the chorizo.) You can make this with lean ground beef or even ground turkey. If you don’t have a Hispanic grocery store in your area, spicy breakfast sausage is an OK substitution for the chorizo. Just remember to cook and drain the fat from whatever meat you use to cut back on the fat and calories. Heat olive oil in a large skillet over medium high heat. Add onions, potatoes and garlic and cook until onions start to brown and caramelize. Stir often and turn down heat if vegetables begin to burn. About 10 minutes. Add salt, cumin, oregano and green chili sauce. Cook for 1 minute. Add chorizo, breaking it up and stirring it into vegetables. When chorizo has browned, add the ground meat. Break up meat and stir into other ingredients. When meat has browned, add in the diced tomatoes. Stir to combine with other ingredients. Cover skillet and turn down heat to low. Simmer, stirring occasionally, for 10 to 15 minutes. Posted in Gluten Free, Recipes, Venison and tagged beef, chorizo, ground meat, rice on April 18, 2011 by Anne-Marie Nichols. Nice work! I was gone on vacation when this posted but i loved the project. Never have made a picadillo, and you inspire me to try making some. I enjoy Allesio’s blog a lot, and this is a great pick from his treasure trove! This looks really delicious! Thank you for sharing the recipe :). Looks tasty. It’s been awhile since I’ve made it. I like mine with olives but I like the idea of adding raisins to cut the pungency of chiles, etc. Very nice rendition of my Picadillo 😀 Love the chorizo in it yum! Can I have a taste? Wish I had a transporter, like on Star Trek, to send you a sample! Would love to try this! We don’t have any vension this year and it is very disappointing! This looks yummy! We had oodles of venison this year, which was why we chose to have the extra made into chorizo sausage. I think we’ll do it every year because it’s so delicious. That is an awesome dish, I bet it tasted fabulous! Great adaptation 🙂 Thanks for playing along this month, it’s been so fun hopping from blog to blog! What a great recipe and isn’t this fun to bake secretly from others’ blogs! Can’t wait for more. I’ve only made Picadillo once and it was delicious. Time to make it again! Great recipe choice!